At 1,400 meters above sea level you can enjoy the absolute tranquility in the middle of the magnificent mountain scenery. A typical Walliserhaus from 1926 but lovingly renovated in 2014. View of about 8 mountain peaks over 4,000m (view of Kleinmatterhorn) and the opposite Ried Glacier. Numerous hiking boots from easy to challenging possible. Challenge for bikers, as the terrain on the ground is steep. Adventure mountain railways (Kalpetran Embd and Embd Schalb) a challenge for courageous holiday guests! In Embd, Hasol3, you are at about 1'400 m.ü. Sea. That is why it is imperative to visit us with good winter tires on your vehicle !!! Exceptionally productive snow precipitation can lead to unpredictable large avalanches in the mountains. So it is also possible for us up in Embd / Hasol3 (also already occurred), that you are then blocked on your arrival and / or departure by protective barriers of the municipality. In the attic there are 9 more decent beds available. Two sep. WC where a toilet has been supplemented with a spacious, floor-level shower cubicle. The natural, modern and 2014 newly created living and dining kitchen with island invites active lingering of individuals as well as several people. The two apartments can also be booked together by groups. In this case, you can choose whether you cook yourself or give us the order in a half board. Furthermore, we offer you from a number of people of min. 4 people ½ to all-day creative seminars. For example: herbs or mycology as well as accompanied hiking tours. The apartments are rented after prior reservation only on a weekly basis. One (from 16 o'clock) - bezw. Ausjeking (until 10 o'clock in the morning) takes place on Saturday. Normally you will receive me personally on site at Hasol 3, 3926 Embd bezw. Adopted. Bücki our holiday property in Hasol 3 Embd, it is a 100-year-old house (built 1924-1926). The ceilings in the premises still exist today from the original Berglerchen wooden floorboards. These are z. T. disappeared, therefore, fine gaps between the individual wooden planks have emerged. If the overlying floor is severely shaken when walking (eg by playing children), fine wood flour can escape from the lower deck floor joints. Even after a thorough home cleaning, it is therefore possible that you will encounter this fine wood pellets, for example, local dust deposits. The hygienic premises such as kitchen and bathroom, are provided with mortar plastered ceilings and therefore no impurities can escape there. 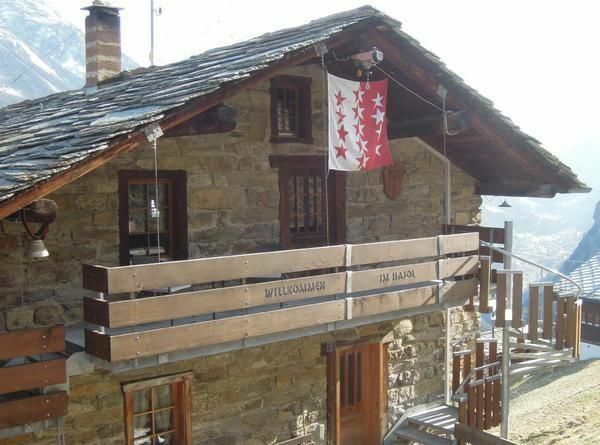 Welcome to Valais, in the Sonnenstube Schweiz! - Pet: per object per week costs 4.45 EUR (compulsory). Etwas den Berg hoch erreicht man das Chalet mit herrlicher Sicht auf die umliegenden Berge. Der sehr zuvorkommende Vermieter hat die Wohnung und vorallem die Küche ideal ausgestattet sodass man auch mit vielen Gäste konfortabel Urlaub machen kann. Saas, Zermatt oder auch andere Skigebiete sind am besten per Auto zu erreichen, man kann jedoch auch mit der Seilbahn ins Tal und dann die Bahn nehmen. Ich hoffe es ergibt sich wieder einmal die Möglichkeit unsere Ferien dort zu verbringen.